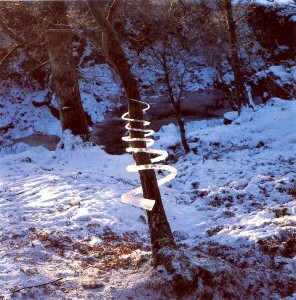 His work is breathtaking yet intentionally temporary, and considering this time of environmental awareness, I find him even more relevant than before. 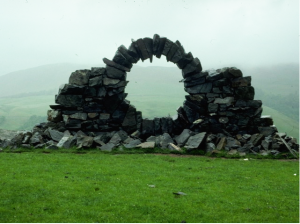 Hopefully you already know who Andy Goldsworthy is, but if not, consider this your introduction to a profound and unique artist who was a source of inspiration to just about every artist friend I ever met in college. 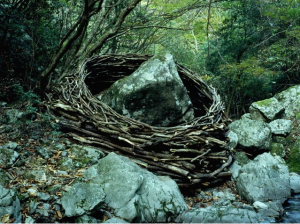 His work is breathtaking yet intentionally temporary, and considering this time of environmental awareness, I find him even more relevant than before. 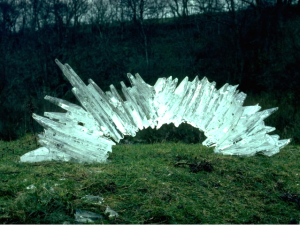 …He deliberately explores the tension of working in the area where he finds his materials, and is undeterred by changes in the weather which may melt a spectacular ice arch or wash away a delicate structure of grasses. 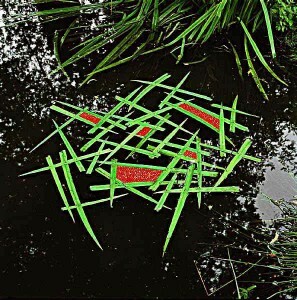 The artist’s intention is not to “make his mark” on the landscape, but rather to work with it instinctively, so that a delicate screen of bamboo or massive snow rings or a circle of leaves floating in a pool create a new perception and an ever-growing understanding of the land. There are so many things that speak to me in what he does. 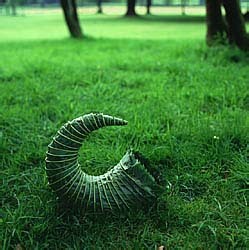 First of all, the idea of playing with found objects in nature to create something beautiful that you know you cannot keep, is reminiscent of the way in which children experience the natural world. 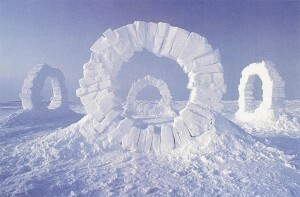 Think of all of those sandcastles we built as kids. Despite the knowledge that the tides would take them after we went home, we still put painstaking work into getting them just right. I can clearly remember the feeling of discovery during that process. I even remember watching the tide come in at times before I was done, and washing away the fruits of my labor. But that was riveting too, because once the waves rolled back from the shore, that fact that the sand was again undisturbed was like some sort of magic trick. 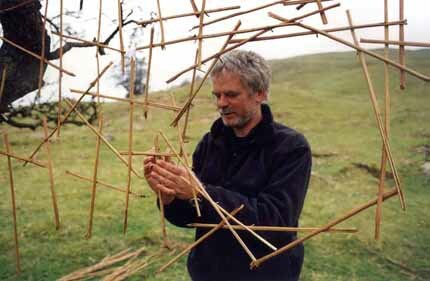 Goldsworthy extrapolates this concept: His work is very complex in structure, execution and artistry (nothing like my sandcastles…not matter what I’d like to believe), but is still underpinned by the same idea of being in the moment, experimenting with what’s on hand and then releasing it to time. This is a very powerful, difficult position for an artist. The emotional (and sometimes physical) energy it takes to create, makes it painful to let our work out of our control. It’s like giving a piece of ourselves away. 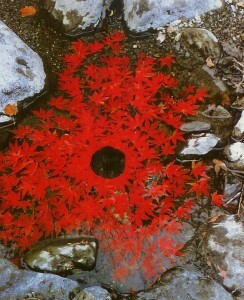 Yet this is the premise of all his work, which makes it even more beautiful, and the generosity all of it more profound. 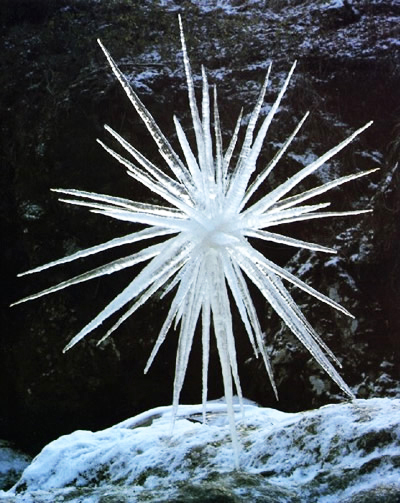 Secondly, his work is very surprising….back to that concept of discovery again. 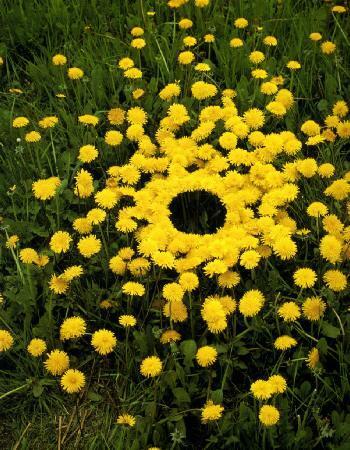 In the same surprising way children invent their own uses for things, Goldsworthy rearranges the things we dismissively crunch beneath our shoes, into spectacular arrangements that showcase their beauty. 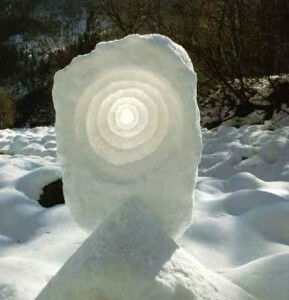 When you see his work you feel like you’ve been missing a lot of obvious things around you…which you have. I am posting a numbers of photos below (with descriptions for many) so you can see for yourself. 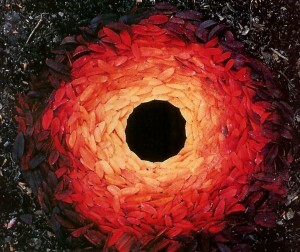 And finally, I think there is a very big lesson for all of us in Goldsworthy’s world view. 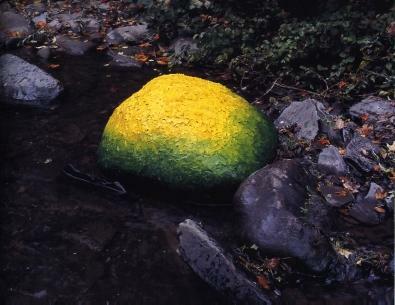 His beautiful work, done on a very localized scale, is meant to vanish, the proof of its existence provided only by his photography. We live in a world where until recently, the goal was always to create things of permanence. 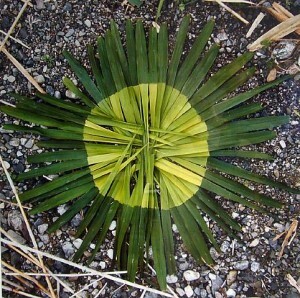 It’s a hard paradigm shift that the human consciousness is now trying to make. We like to keep ‘things’ for a long time. And we often give no thought to their ultimate fate. We are voracious consumers, but most of what we consume is spewed back in a foreign form into the natural world which cannot wash, melt or blow it away. We’re super concerned that we may face inconvenience if our ‘things’ are meant to be temporary from the start. 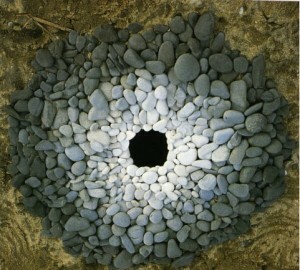 What I love about Goldsworthy is that he embraces this as the reality of his work. 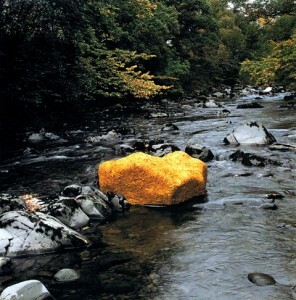 I’d highly recommend adding Andy Goldsworthy: A Collaboration with Nature to your library!